It’s a table with a lot of data. As it is, it doesn’t tell us much. However, as it is sometimes said: “a picture is worth a thousand words.” In this case, transforming the data in the table into a graph makes a very clear picture of what is really going on with enrollments at the MnSCU state universities. Metropolitan (purple) is up a lot. Mankato (red) and Winona (yellow) are up. Bemidji (orange) and Southwest (blue) look pretty stable. Moorhead (green) and St. Cloud (black) are in decline. From the graph, it is clear that St. Cloud is not just in decline. Compared to the other MnSCU universities, it is more appropriately “in the toilet.” Considering the projected enrollment decline at SCSU, enrollment will drop from its high in FY10 of 15,096 FYE to 11,279 FYE in FY17, which is a drop of 3,817 FYE and corresponds to a drop of 25.3%! Looking at Moorhead, the enrollment decline from FY03 (6,993 FYE) to the projected enrollment for FY17 (5,661 FYE) is a drop of 1,332 FYE and corresponds to a drop of 19.0%. However, the enrollment drop at Moorhead took a total of 14 years to achieve. SCSU will accomplish its’ 25.3% drop in just 7 years or perhaps earlier! 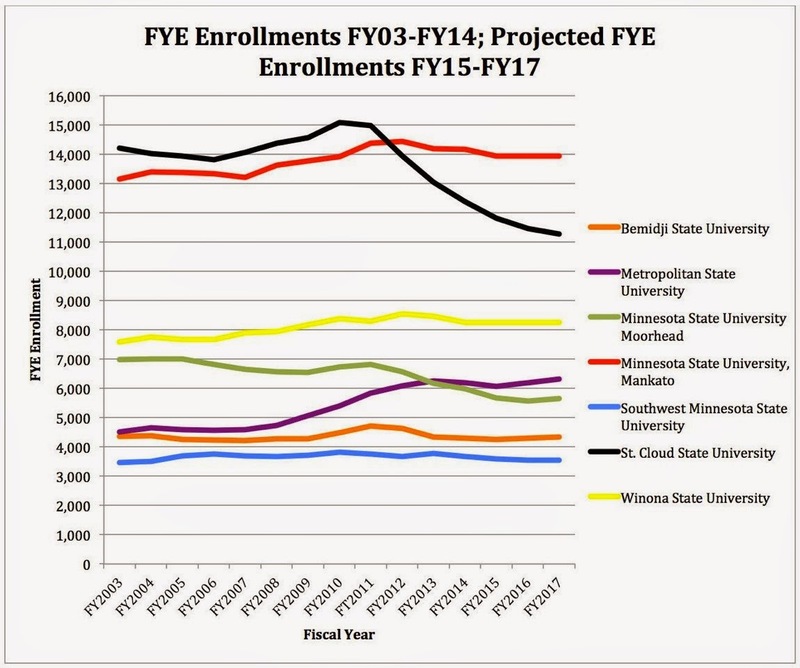 As things now stand it is quite possible that SCSU’s FY15, FY16, and FY17 projections for significantly under estimate the actual decline in enrollment. The FY15 fall enrollment is well below the original projection. Based on the recent history of projections made by the SCSU administration, it is highly likely that the projected decline will reach 25% in only 6 years. When looking at the graph, it may be heartening to think, or more correctly hope, that the rate of enrollment decline at SCSU is decreasing. However, the experience of the past three years may make these projections more wishful thinking rather than responsible estimates. In FY12 the enrollment dropped 5.9%, in FY13 the enrollment dropped 5.4%, and in FY14 the enrollment dropped 5.1%. In March 2013, the projection for FY14 enrollment was for a decline of 2.4% so the projection significantly underestimated the actual decline. This March, the projection for FY15 enrollment was 3.2%. Already we know that summer enrollment was down 9.4% and that fall enrollment is down as of 12/3/14 5.5%. Unless a miracle occurs and spring enrollment is up substantially, enrollment for FY15 is going to be significantly down from the March projection. Even this past October, the revised projection for FY15 was for a decline of 4.5%. Again, something that is not likely to be realized except in someone’s fantasies. If you look back to the projections this past March, the enrollment projection for FY16 was for a 2.3% decline and for FY17 a 1.3% decline. The administration revised these projections in October upwards to 3.0% and 1.7% for FY16 and FY17, respectively. Given the significant underestimation of the decline in enrollment the prior two years, it is hard to believe that the optimistic decline in the rate of decline of enrollment will be realized. More likely, the projections are going to be significantly in error—and not in a good way! Absent of hard evidence of a significant change in enrollment patterns, a 4-5% annual drop in enrollment might be more responsible instead of these “Pollyana-like” projections. Let’s look at the big picture. The enrollment decline at SCSU from FY10 to FY17 represents a loss of 268 FYE more than the total projected enrollment at Southwest State University (3,549)! Further, if you use an estimated revenue of $11,500 per FYE, a drop of 3,817 FYE represents a loss of revenue totaling $43,900,000! Importantly, this loss will have occurred within only six or seven years! 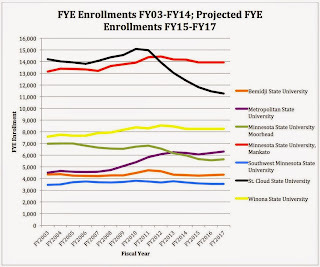 I hope that those who keep saying that the “demographics” are the reason for the enrollment decline at SCSU can explain how only two MnSCU universities have significant declines and that SCSU is the absolute leader with a 25.3% decline and projects a decline in absolute FYE greater than Southwest State’s total enrollment. During President Potter’s tenure, SCSU has gone from leading rival Mankato by 848 FYE to trailing in FY15 by over 2,121 FYE, a staggering reversal of 2,969 FYE! At one time, SCSU bragged about being the “flagship” university in MnSCU. Looking at the data, it is clear that this is no longer true. I guess it’s time to hire another consultant. Dr. Dogood ends this article by associating the term ‘flagship university’ status with Saint Cloud State University. Except for a few self-promoting members of SCSU, it has never been the ‘flagship’ of MNSCU. Nor historically was it known as one during the time before the MNSCU reorganization under which it belonged to the Minnesota State Universities system. It has been traditionally known both socially and formally as a ‘party’ school. The problem with this fond ‘memory’ is that none of the MNSCU institutions are anywhere near the same classification/status as a true flagship such as the University of Minnesota. Additionally, flagships universities don’t just erase bad grades from student transcripts randomly like the 2013 Scandal. It would be beneficial for the entire state if the Charting the Future strategic planning process would acknowledge this issue and actually fund the state universities at a level where they could compete for students regionally against for example North Dakota State, University of North Dakota, University of Wisconsin Eau Claire, University of Wisconsin Milwaukee, Iowa State, University of South Dakota etc.